Iron Maiden will release the double- disc DVD “Maiden England ‘88” on March 25 (UK; March 26 in North America). The metal legends are offering up a preview of the set with the posting of “Wasted Years” from the package (note: video access is restricted in some territories). 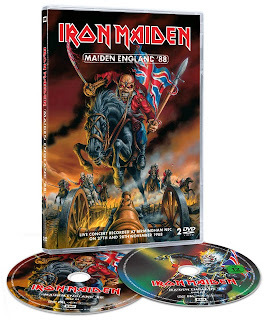 As well as the VHS stereo soundtrack by Martin Birch, the band’s producer between 1981 and 1993, the DVD also includes a brand new 5.1 audio surround mix by Maiden’s current producer Kevin Shirley. Other special extras on the bonus disc include Twelve Wasted Years. First released as a longform VHS in 1987 and available for the first time on DVD, this documentary runs for 90 minutes and includes archive interviews and dynamic live footage from the band’s beginnings in the now legendary Ruskin Arms pub, via London’s Marquee club and three World Tours. Five promo videos for the singles from the aforementioned albums are also featured and have been carefully restored and improved upon from the original films using the very latest software with the audio remastered in digital stereo.